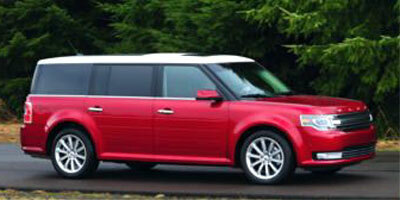 The 2013 Ford Flex will be remembered by Flex historians as the one that finally realized its full potential. In years past, it was always one thing or another with Ford’s lovably square minibus. When the Flex first came out, its steering wheel didn’t telescope, making the driver seat a no-go for tall folks. The twin-turbocharged “EcoBoostâ€ V-6 wasn’t available, either. 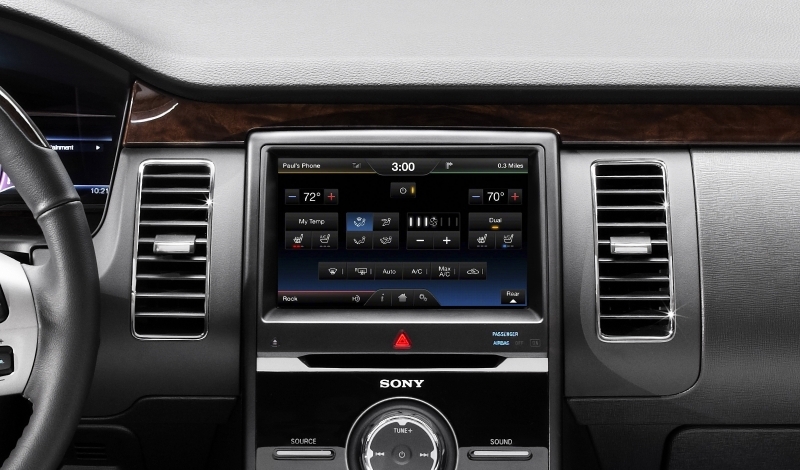 Ford fixed both foibles in short order, but the Flex’s old-school central control panelâ€•think black Chiclets on silver cardboardâ€•continued to give us pause, especially when the mechanically similar Explorer debuted for 2011 with the sleek MyFord Touch panel. Another head-scratcher was that the Flex’s standard V-6 randomly made about 30 fewer horsepower than the Explorer’s despite sharing the same 3.5-liter displacement. Happily, Ford seems to have realized that there’s no reason why its fashion-forward crossover should be behind the times. The new and improved version of MyFord Touch is now available on Flex, and it magically brings the aging cabin up to date. The standard V-6 gets a power boost to from 262 horsepower to 287, nearly equaling the Explorer’s 290 horsepower. And although the exterior was the last thing about the Flex that needed updating, Ford went ahead and gave the Flex a nip and a tuck anyway, including a new front end on which the iconic blue oval has been replaced by the word “FLEXâ€ in shiny block-caps. Our test vehicle for this review was a Flex Limited with EcoBoost, but keep in mind that the regular Flex gets the same stylistic and technological enhancements for 2013, plus those extra 25 horses. If you’ve been on the fence about the Flex, hem and haw no more, because with the 2013 model, Ford’s finally got it right. The tweaked styling solidifies the Flex’s status as the funkiest crossover in town. The twin-turbocharged “EcoBoostâ€ V-6 makes this three-row crossover quicker than many sport sedans. The third row is one of the few we’ve encountered that can comfortably seat adults. The standard MyFordTouch system revolutionizes the dashboard’s appearance, and the Flex gets the improved second-generation system right out of the gate. As ever, the Flex’s interior materials are excellent for this class. The Flex’s seats are oddly narrow, especially at the hips. Although Ford has tried to improve the handling, there’s no getting around this crossover’s bus-like length, which can feel intimidating from behind the wheel. MyFord Touch may be better than before, but it still has some ergonomic shortcomings. Like many modern Fords, the Flex has aggressively angled front headrests that don’t pivot to provide relief. Lastly, the Flex Limited with EcoBoost costs a pretty pennyâ€•plan on spending around $45,000. You know how some cars drive smaller than they are? The Flex isn’t one of them. Notably, the Explorer feels even larger, so the Flex would be our choice from a driving standpoint (actually, from every standpoint). But hey, we’re talking about a three-row crossover with real passenger space, so of course the Flex doesn’t handle like a dream. Just don’t go in expecting car-like dynamics from the Flex’s Taurus-based underpinnings. Once you get over the size, the Flex is actually a pleasant vehicle to pilot. The compact three-spoke steering wheel inspires confidence, and the electric-assist steering system is reasonably precise and responsive. The nautical body motions through corners pay off in normal driving, as the Flex floats calmly over patchy pavement, even with our tester’s 20-inch wheels. Road and wind noise are respectably subdued. 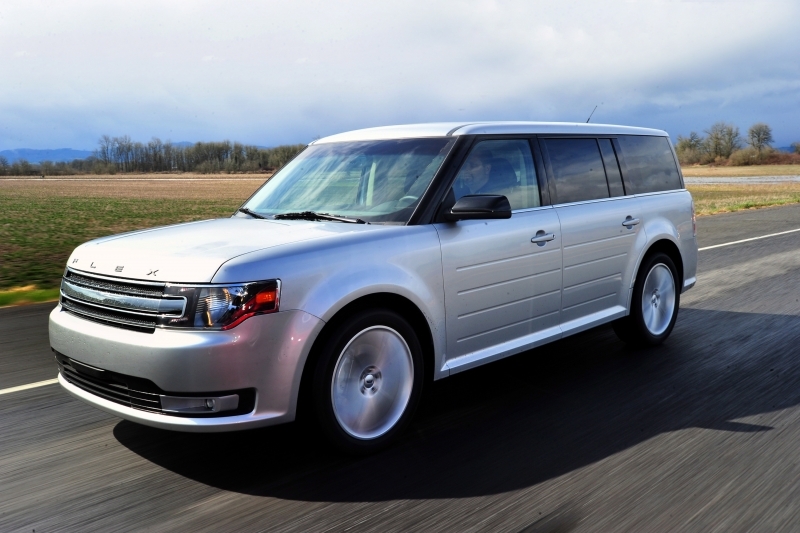 The 2013 Ford Flex Limited with EcoBoost is powered by a twin-turbocharged 3.5-liter V-6 that generates a robust 365 horsepower and 350 lb-ft of torque. All-wheel drive is standard, as is a six-speed automatic transmission with paddle shifters. Before you get too excited about those output numbers, consider the fact that the Flex EcoBoost weighs about 4,800 pounds. There’s a lot of metal to move here, but thanks to those twin turbos, there’s big power on tap practically from idle to redline. The transmission could be more refined; we detected some half-hearted attempts at rev-matching during downshifts, but for the most part, this is an unremarkable gearbox. Still, the Flex EcoBoost is one of the most entertaining three-row family vehicles at any price. 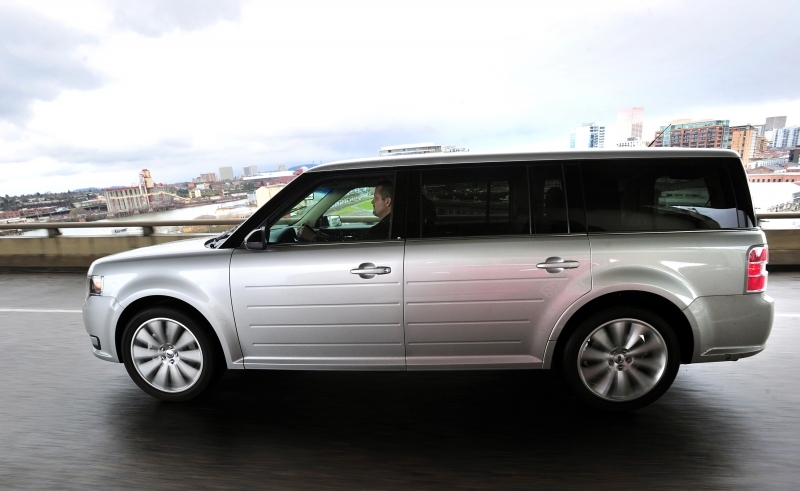 The 2013 Ford Flex EcoBoost returns an EPA-estimated 16 miles per gallon city, 23 mpg highway, and 18 mpg combined. That’s not exactly stellar, particularly for a vehicle with “EcoBoostâ€ in its name. To be fair, the EcoBoost does achieve almost the same fuel economy as the regular AWD Flex, so you’re basically getting all that extra power without compromising on efficiency. New for 2013, the Flex Limited with EcoBoost comes standard with the MyFord Touch system, which includes Sync voice-recognition capability, an eight-inch central touch screen, two customizable 4.2-inch displays that flank the analog speedometer, twin USB ports, and even WiFi hotspot functionality if you’ve got a USB mobile broadband adapter. Ford was raked through the coals over the past couple years for some early MFT glitches, but the Flex gets the new second-generation software, and we can report that it indeed constitutes an improvement over the original version. Notably, the the text is larger, the display screens are crisper, and the virtual buttons are more clearly marked as such. However, we still question the fundamental ergonomic soundness of MFT. The climate controls, for example, consist of flush-mounted buttons on a touch panel, so you have to take your eyes off the road to make adjustments. 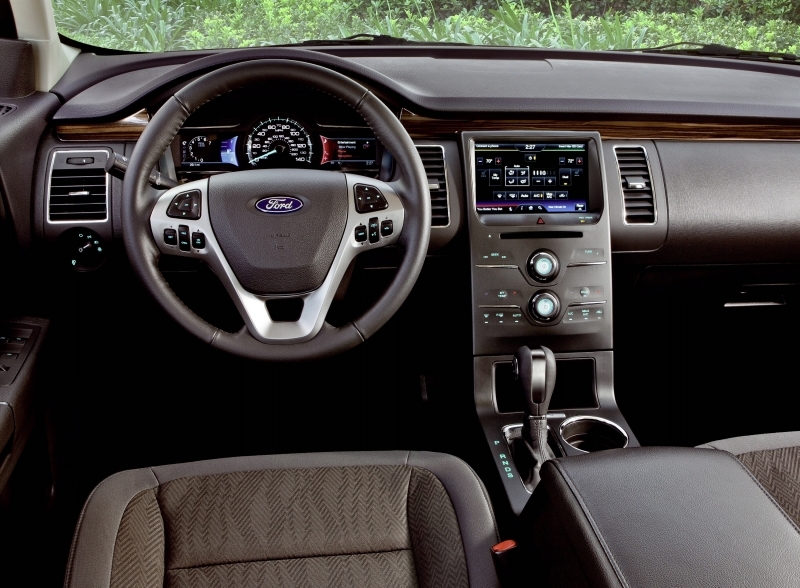 We can’t overstate how much nicer the Flex’s interior is with MyFord Touch in the mix. The gauge cluster and center panel are at once futuristic and restrainedâ€•a perfect look for a technological powerhouse. Meanwhile, the Flex’s supple, creatively textured dashboard materials are so delightful that you could put a Lincoln badge on the steering wheel without changing a thing. We just wish the seats were equally well-executed. As for the rear seating rows, they’re outstanding. Six-foot adults can lounge in the third row without complaint. Despite its prodigious passenger space, the Flex isn’t the handiest crossover when it comes to hauling stuff around. There’s 20 cubic feet behind the third row, 43.2 cubic feet with the third row stowed, and 83.2 cubic feet with the second row folded forward. You can do a lot with that kind of room, but you can do more with, say, a Chevrolet Traverse. As noted, we didn’t think the Flex really needed a makeover, but we’re fans of that new face, particularly the strong single-bar grille that juts into the headlights at its extremes. The “FLEXâ€ text looks cool, too, and the boxy, Mini-Clubman-on-steroids profile is still a hoot after all these years. No two ways about it, the Flex is one of the most distinctively styled vehicles on the road. The Flex EcoBoost’s clearest competition is in-house, as the Explorer uses the same platform and can even be equipped with the EcoBoost motor for 2013. Otherwise, we’re at a loss. The BMW X5 has an available third row and comparable performance, but it’s more expensive, and its third row is really just for kids. A dark-horse option would be the Mercedes-Benz R-Class, which offers similar passenger space but less power and style. The 2013 Ford Flex Limited EcoBoost carries what looks like a high price tag, but when you think about what it brings to the table, $45,000-plus seems almost reasonable, especially compared to the rest of the sub-segment. Technology, performance, style, three rows of adult-friendly seatingâ€•this thing’s got it all.